Immunotherapy, which harnesses the power of the immune system, is one of the most promising forms of cancer therapy and has been shown to work well against some types of cancer. But in early studies, breast cancer has proven to be largely resistant to immunotherapies, which are effective in only about 5 to 10 percent of patients whose tumors have spread or metastasized. The fact that immunotherapy does work for some patients indicates that there is a signal for activity, and scientists are trying to make more breast tumors responsive to immunotherapy by increasing their visibility to the immune system. A new study by Vanderbilt-Ingram Cancer Center (VICC) investigators suggests that targeting specific molecules in the tumor called methylating agents can turn up the immune response. Principal investigator and corresponding author Justin Balko, PhD, PharmD, led the study recently published in Nature Communications. 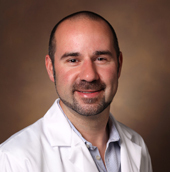 Balko, assistant professor of Medicine, serves as leader of Molecular Oncology in the VICC Center for Cancer Targeted Therapies. The body’s immune or T cells are trained not to attack proteins found in normal cells. In human breast cancers, the investigators found that MHC-I genes are suppressed by a process called methylation, which enables them to hide from the immune system. In cell lines and mouse models, the researchers used a hypomethylating drug called guadecitabine which upregulated MHC-I expression making it easier for immune cells to recognize the tumors. “Importantly, we saw a large degree of CD8+ or cytotoxic T cells infiltrating into the tumor after treatment, which suggests they were recruiting more immunologically active immune cells,” Balko said. The investigators also focused on the tumor microenvironment where they saw T cells surrounding the tumor, but after treatment with guadecitabine those immune cells appeared to migrate into the tumor. With the help of H. Charles Manning, PhD, Ingram Professor of Cancer Research, and the Vanderbilt Institute of Imaging Science, the group was able to image T cells as a biomarker of response. Based on this research, the investigators believe guadecitabine might be useful when used in combination with other immunotherapy drugs. “We know that many immune responses are thwarted by the immune checkpoint called PD-1 and PD-L1. We saw some tumor regression with the guadecitabine alone and that suggests to us that maybe we can get even more complete responses by treating with a hypomethylating agent plus anti-PD-L1 immunotherapy,” Balko said. The next step is to try to replicate this preclinical data in more models and eventually launch a clinical trial to determine if more patients respond to PD-L1 by pretreating with hypomethylating agents. Other investigators who participated in the study include first author and former VICC postdoctoral fellow Na Luo, PhD, Nankai University, Tianjin, China; Mellissa Nixon, PhD, Paula Gonzalez-Ericsson, MD, Violeta Sanchez, MS, Susan Opalenik, PhD, Michael Nickels, PhD, Fei Liu, PhD, Mohammed Tantawy, PhD, and Melinda Sanders, MD, Vanderbilt; Huili Li, PhD, and Cynthia Zahnow, PhD, The Sidney Kimmel Comprehensive Cancer Center, Johns Hopkins Medicine, Baltimore, Maryland. Funding was provided by The V Foundation for Cancer Research, the China Scholarship Council, the National Cancer Institute, a division of the National Institutes of Health (R00CA181491), the Breast Cancer Specialized Program of Research Excellence (SPORE) (P50 CA098131), VICC Support Grant (P30 CA68485), Susan G. Komen for the Cure Foundation, The Kleberg Foundation, Trans-Institutional Programs (TIPS) award to the Center for Molecular Probes, and the Vanderbilt University Office of Research support of the Radiochemistry Core Resource.